July 4th weekend was hot. All day long the sun beat down and broiled the city, blinding and exhausting it. You were either at the beach or in your house, air-conditioned. Napping was involuntary. They were lighting off explosives all weekend here in Van Nuys, late into the night. I imagined a city all around me, of thousands of illegal aliens, doing illegal things, joyfully and recklessly. Around 7 pm, the sun settled down, the temperatures cooled, and after a dinner of fried salmon and cold tomatoes with red onions, I put on my sandals, walked out into the dusk and found myself on Kittridge Street. West of Kester, east of Sepulveda, there are a few neat blocks of solid, mid 20th-century houses, still well-kept and outwardly honorable. Lawns are trimmed, eaves are painted, and there are few broken down properties. 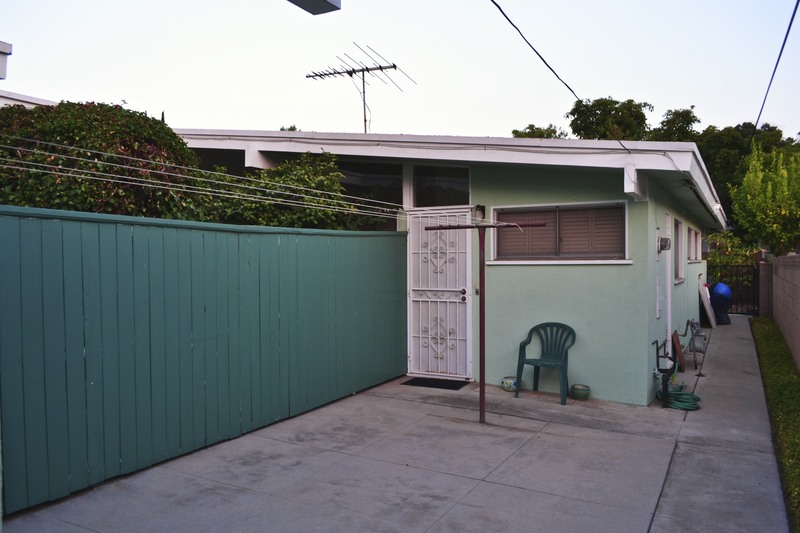 Too poor for renovation, too wealthy for destruction, these houses were not torn down and mansionized by investors, as one sees on many pockmarked neighborhoods in Sherman Oaks. Instead, this tidy and sturdy pocket of bourgeois respectability, in the heart of Van Nuys, is sandwiched between Sepulveda’s whore show and Kester’s impoverished subculture. 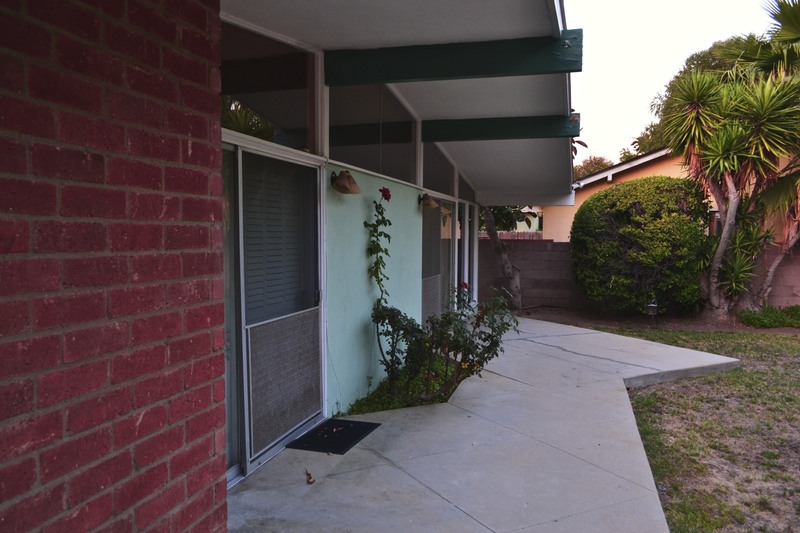 At 15126 Kittridge, a pistachio green and vanilla trimed house, with vaulted ceilings, open carport, and welcoming courtyard, is for sale for only $315,000 or $190 a square foot. Two friendly guys were working on a 1979 BMW, next door, when I approached the house. They told me to walk right into the courtyard and around the back. First impressions: clean, solid, bright. 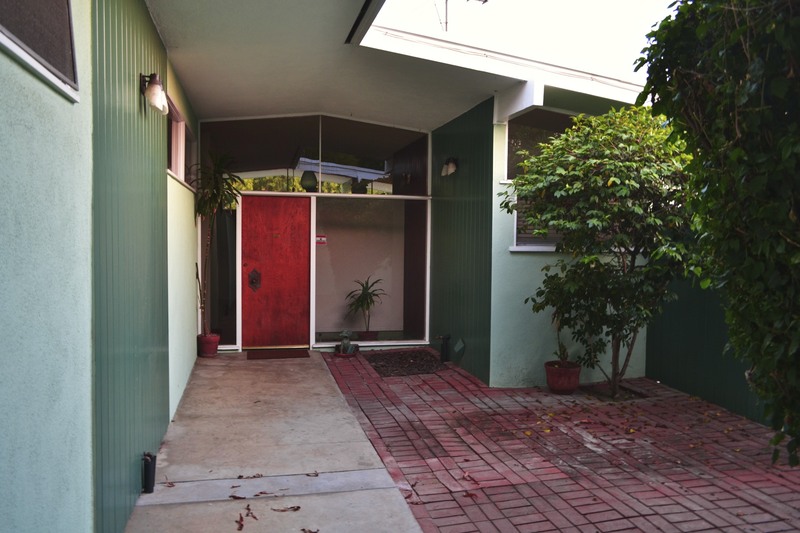 There was a private, enclosed, elegant front entrance under angled eaves. Around the side yard, an old steel pole clothes-line was planted into the concrete, just outside the kitchen door. A green plastic chair, nearby, marked a place where a tired woman, no doubt, had rested, chores done, after she had pinned damp cotton clothes to dry in the eternal Southland sun. 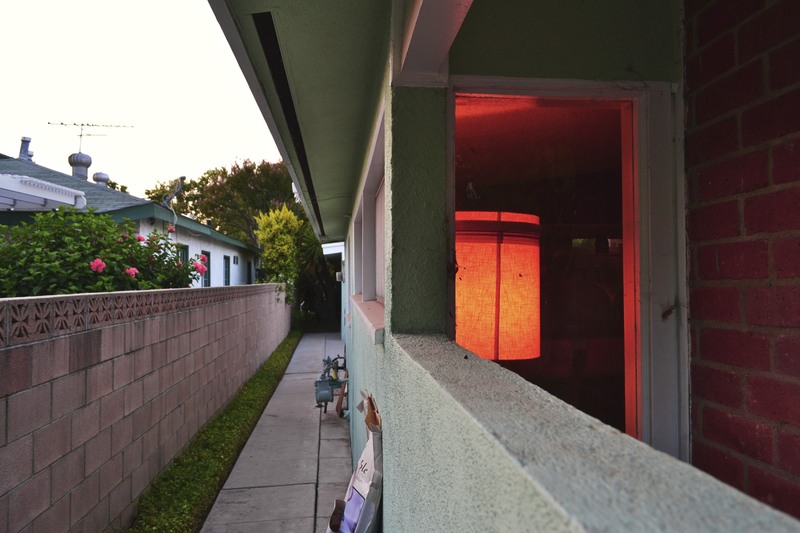 There were leftover forms from the last century all around: a TV antenna, a backyard patio in zig-zag concrete pattern, and a tall drum shaded lamp in the side window. And sliced into the stucco walls: high clerestory windows, everywhere, bringing light into the living room and into every bedroom; bedrooms where people, from Sputnik days to iPhone times, had slept, slept for 55 years, in suburban solitude, through war, riots, assassinations, movie premieres, and freeway pile-ups. It was quiet here, peaceful, lovely. It was nothing fancy, just something inherently American and naively optimistic in design and intention. Somewhere in America, long ago, people had built with confidence and care, incorporating the latest Space Age designs, but encasing them in tradition, in family, in expectation, that life could be orderly, well run and peaceful. But the people of 15126 Kittridge had moved out of here, some time ago, so it was a preserved family house without a present day family, a mute museum of life, of time past and lost forever, and thus without love or conflict, laughter or pain. Perhaps only the electric lamp on a timer and weekly visits from the gardener kept this home alive. As I walked away from 15126 Kittridge, the sky dimmed, the moon came out. This is absolutely beautiful. As a real estate appraiser and developer, I have been in hundreds of homes such as this one and I have come to believe that houses absorb the energy of their long-time occupants and/or creators. I always find myself imagining the family who occupied the house and can tell if there was love, tension, loneliness, joy, etc. On the rare occasions when I’ve later met the previous owner, it’s amazing how accurate my sense was. You’ve captured that phenomenon beautifully in this piece. It brought tears to my eyes!